Stationing is the fundamental system of measurement used for pipeline layout and construction. Stations are reference points that are placed along the horizontal measurement of a route centerline or a baseline at some regular interval. Generally, the distance between two adjoining stations along a route is 100 feet. The first station located at the beginning of the baseline is 0+00, and the next station located 100 feet from it is 1+00. Therefore, a station number of 10+34.05 denotes 1,034.05 feet (10*100 + 34.05) from the starting station. The station numbers increase from west to east or south to north based on the cardinal direction of the overall pipeline. For pipeline projects, a starting reference station is first established, and all distances along the route centerline are measured from that point location. 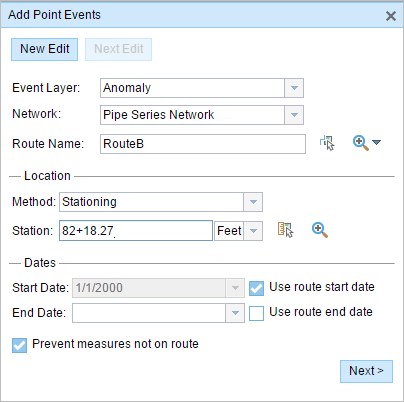 You can add event data to routes by entering station numbers in the Point Events tool interface. The station data is translated to routes and measures for storage. 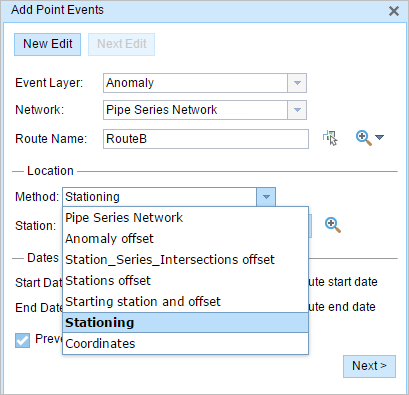 Create a starting or base station on the route and define the station values as offsets from that station. Identify a starting or base station on the route and define the station values as offsets from that location. Use the existing stations on the route to calculate or define measures in the form of station values. You can use this method when stations exist on the route. The measures are calculated using the location and values of the existing stations. This functionality is available only for the LRS Networks that contain a stationing event layer. In the following example, there are three existing stations on the route. Stations A, B, and C have station values of 00+00.00, 50+00.00, and 100+00.00. respectively. The stations increase in value following the direction of calibration of the route, which is from left to right on the map. The measures on the route are located by taking these three stations into consideration. Therefore, the measure of the event (station value 82+18.27) is located nearer to the third station—that is, 100+00.00 between the second and the third stations. In the Location section, click the Method drop-down arrow and choose Stationing. Click the drop-down arrow and choose the units for station values. Type the station number in the Station text box. Click the Select a Location on the Map tool and click a location on the selected route. The measure location will be placed at an offset from the starting station. Click Next to view the Attribute Value table. This table contains all the attributes of the event layer. Provide attribute information for the new event in the table. Check the Show network name check box to see the LRS Network with which the selected event layer is associated. Click New Edit to clear all the input entries in the widget and restore the default values from the geodatabase to the attribute table. Click Next Edit to retain all the existing entries in the widget and the attribute table for the convenience of quick editing of similar characteristics.